Whether or not a planet is inferior or superior depends on its location relative to the sun. Neptune is the farthest planet to the sun and is thus considered superior to all planets. Contrary to what people believe, the difference between inferior and superior planets do not have anything to do with size but the relative distance from the sun. When the orbital path of one planet is smaller than the other, then it is considered inferior. Mercury is the closest planet to the sun, thus it is inferior to all other planets. On the other hand, Neptune is the farthest planet to the sun and is thus considered superior to all planets. Ceres, Pluto, and other dwarf planets in the Kuiper belt are superior to Neptune. A mysterious planet-like object known as Sedna is the farthest known object orbiting our sun. Sedna is 8 billion miles from the sun and has an orbital period of 11,408 years, and a rotational period of 10.273 hrs. There are only two planets that are inferior to Earth; Mercury and Venus. Mercury is the closest planet to the sun and contrary to what many people believe, Earth is closer to Venus than to Mars. The closest distance between Venus and Earth is 24 million miles while the closest distance between Earth and Mars is 33.9 million miles although this has never happened and remains a mathematical possibility. Another assumption that people make is that the planet closest to the sun is hottest. However, Venus is the hottest planets in our solar system and not Mercury. This is because Venus has a denser atmosphere than Mercury and therefore conserves more heat. 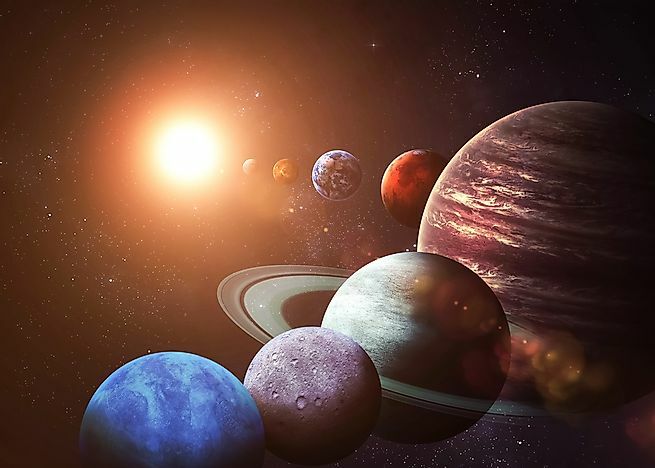 Five planets are superior to Earth; they are Mars, Jupiter, Saturn, Uranus, and Neptune. Mars is the only rocky planet that is superior to earth; the rest are gaseous. Gaseous planets are known as gas giants due to their enormous sizes or are sometimes known as Jovian planets. Mars is the most studied planet after Earth because it portrays some characteristics that are associated with Earth. Astronomers believe that the planet’s surface once held liquid water due to the presence of gullies and eroded surfaces. Unlike Earth, Mars has a less dense atmosphere that allowed the water to evaporate, leaving the planet's surface empty and unable to support life. Jupiter is the largest known planet in our solar system although the imaginary Planet Nine is thought to be much bigger. All the four gaseous planets have ring systems, but Saturn has the most visible ring system of them all.